Dental Sedation for nervous patients / Dental phobia / Fear of Dentist ? SMILE AGAIN WITH FRAZER DENTAL – this is our promise to you. Most Child-Friendly Dental Practice in Ireland , Irish Dentistry Awards 2016. A visit to the dentist doesn’t have to be painful or scary. 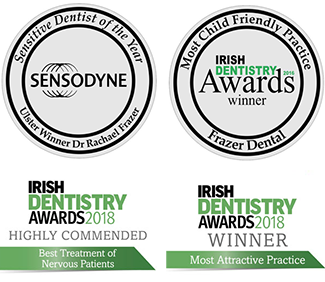 Frazer Dental is a relaxed dental practice set up in 2014 by Dr. Rachael Frazer, a native of Kingscourt, to cater for everyone- children and adults, especially focusing on nervous patients and the elderly. We promise you the most up to date and painless treatments and techniques will be used . We use a camera to instantly show you what we are doing during treatments if you wish to see! Dr. Frazer was crowned Ulster’s Sensodyne Sensitive Dentist of the Year 2015 for her outstanding compassion and care of nervous patients .The national award was based on 1000’s of nominations from nervous patients around Ireland , Dr Frazer has helped 100’s of nervous patients in Kingscourt and the surrounding areas to overcome their fear of the dentist once and for all. We were delighted to win this prestigious national award. One dentist was chosen from each of the 4 provinces of Ireland . We are dedicated to helping you achieve the smile you have always dreamed of, no matter how nervous you are , by learning to trust our caring team, we can help you overcome your fears and smile again! -Our reviews from nervous patients speak for themselves! Read our review page to see how we have helped many nervous patients : children and adults, to overcome their fear of the dentist once and for all. Do you feel you need sedation? Some people may feel that nothing or no one will be able to help them get over their dental phobia. For those of you who feel like that, dental sedation may be the answer. Dental sedation is where we give you a relaxing drug to help you feel less anxious and to relax in the dental chair. In other words, you will feel so relaxed that you will actually forget what you had done at the dentist afterwards . A sedation assessment is necessary – call us today to arrange your sedation consultation. It is important to inform us of your medical history & list of current medications during this appointment. Dr. Aisling Mc Grath has undergone Neuro-linguistic programming training (NLP) with highly acclaimed dental phobia expert, Dr. Brid Hendron and finds these techniques have great benefits in helping anxious patients learn to cope with dental treatment and accept dental treatment without the need for sedation. Give the Frazer Dental team a Facebook message, an email or a phone call today to learn how our friendly team can help you smile again! Main Street, Kingscourt, Co. Cavan.